Clearly not stung from previous experience, HP wants to lead in tablets and smartphones. 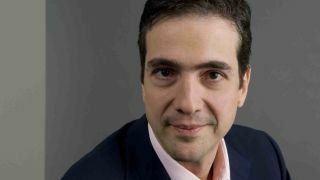 That's the bullish message from HP's Head of Mobility Alberto Torres, who told TechRadar that it was a key aim for the corporation: "The mission in my area is to make HP a leader in the tablet space and eventually smartphones." However he warned that it wouldn't be soon: "Certainly it's not a short term aim [to lead in phones]. It's not something we're looking at for this year. Without looking at specific dates, we're actively looking at our options in that market." Alberto Torres joined HP five months ago from Nokia, where he was responsible for the ultimately unsuccessful MeeGo project - he was behind the design of the N9 that became the foundation for the colourful Nokia Lumia range. He was keen to show us the Android-based HP Slate 7 here at MWC 2013, as well as the business-orientated ElitePad 900, which runs Windows 8 Pro. We asked Torres if it was possible for HP to have a noticeable share of the tablet market in 2013. "Yes, I would say this year that's realistic, but over time we are looking at a leadership position. We want to be up in the charts. I think it's possible. Also you have a little bit of a phenomenon where about a third of tablets are built by no-name vendors and most of them are very poor products. "Those will continue to exist but I don't think it will be a third of the market. We really are intending to become a leader in this space. It's not going to happen overnight, it's going to be a journey. Over the next three years we're going to make big strides. And this year I think we'll get some significant volume on some of these products." It's a young market, we suggested. "Exactly. People forget that. It is a really very young market. It's changing dramatically. The opportunities for us to play are really fantastic. [The phone market] is mature but it's a very dynamic market. Everybody says the market is dominated by two players but then you go back two years and it's a different two players. At least one of them is not there! "You are just beginning to see the effects of mobility and how it will transform computing. We're going to see innovation across all kinds of devices including PCs. I think it's an exciting time"
Part of HP's strategy is to expand its product range: "We intend to have a bigger portfoilio. With [Slate 7 and ElitePad 900] we're almost bookending the portfolio with an entry level small tablet to a large tablet. You'll see a number of products filling out our range this year and next." We asked whether there was any possibility of HP having its own OS again after the offloading of WebOS. Is it all about Android and Windows for now? "Correct. You can never say never, we're obviously open to different alternatives over the years but at this point we're going to play to the ecosystems that have traction. That's what we're doing." And is it just as simple as saying that it's Android for consumer use and Windows for business as far as HP is concerned? "It's fair to say that Android has a lot of traction and Windows has more traction in the commercial space, but lines will become blurred. "We're not trying to create distinctions, just what our customers want. There will be opportunities for Windows in the consumer space and over time there will be more opportunity for Android in the commercial space." And what about Windows RT? "It's something we're considering. We did not participate on the first [cycle] and that probably worked out well for us, but with RT there is potential as well and when the timing is right and the opportunity is right we'll participate." We asked Torres where he was aiming the Slate 7 and the reasons for launching this device first: "It's our first Android device, very much targeted at the consumer entertainment segment, the fastest growing segment at the moment. "I think it's a good combination of features including the rear camera, which is quite unusual for this type of product. Which is surprising as they move around with people, and people take photos with 10.1-inch tablets. All 10-inch tablets have cameras where the 7-inch tablets sometimes don't." Crucially, Torres believes HP can leverage its existing success in PCs to succeed in the tablet space. "Obviously we are going to look at more premium segments, but here we need to be price competitive. What attracted me to join HP is that when you look to win in tablets, it's not a great leap. "You need to understand [the technology of tablets] but the other thing is a game of brand and service and channel reach, and those are things that HP is quite strong on. You're going to see developments in differentiation with connectivity, security and leverage of our expertise."